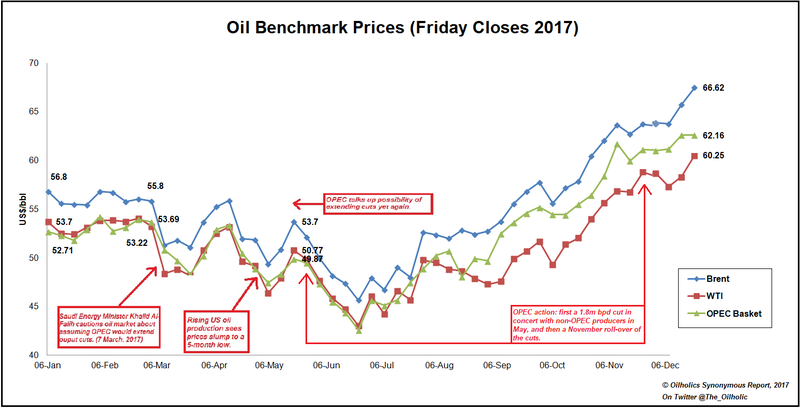 Crude year 2017 is firmly behind us, and the Oilholic has summed up weekly closing prices for you on the chart adjacent, along with key points of the year which ended on a high for the oil market (see left, click to enlarge). That uptick has extended well into January. It can certainly be said that 2018 has started on a frantic, interesting and massively bullish note for the oil market. Brent, the world’s preferred proxy benchmark, finally closed at $70 per barrel on Friday (26 January); a first Friday-close above the said level since 28 November 2014. However, that doesn’t necessarily mean yours truly has turned bullish. The Oilholic continues to follow his preferred mantra of being net-short over the long term, and long over the short term. The reasons are simple enough – more US oil, even if purely for domestic consumption – is inevitable. Inventories have rebalanced, and demand is picking up, but relative to that, there is still plenty of oil in the market. Yet, there is a school of thought out there that the International Energy Agency (IEA) has exaggerated the significance of shale. The Saudi Oil Minister Khalid Al-Falih, among other influential voices at OPEC, has endorsed such a thinking. However, with US production tipped to cap 10 million barrels per day (bpd) in the first quarter of 2018, and may even touch 10.3 million bpd, one doubts the IEA has exaggerated things. US rig counts have continued to rise in step with the oil price rise. As such, there's little to have faith in a long-term $70 Brent price, especially as OPEC itself will ramp up production at some point. To get an outside-in perspective, on 25 January this blogger spent most of his day interacting with physical crude traders in Amsterdam and Rotterdam. Hardly anyone seemed to buy in to the bullish chatter that was coming out of the World Economic Forum 2018 in Davos. So the Oilholic is not alone, if you take him at his word. Away from the oil price, many say the biggest contribution of cryptocurrencies has not been Bitcoin and Ethereum, but the creation of blockchain, which is akin to a digitally distributed ledger that can be replicated and spread across many nodes in a peer-to-peer network, thereby minimising the need for oversight and governance of a single ledger. This is now being actively pursued by major energy sector players, and developments at their end have kept the Oilholic busy for better parts of two weeks scribbling stories for Forbes. On 18 January, Shell’s trading arm unveiled its investment in a London-based start-up Applied Blockchain. Just days later on 22 January, Total and several energy traders joined TSX Venture Exchange-listed BTL's blockchain drive aimed at facilitating gas trading reconciliation through to settlement and delivery of trades using blockchain. BP, Statoil and other traders such as Koch Supply & Trading and Gunvor have all recently gone down the blockchain path. Then on 26 January, Blockchain outfit ConsenSys and field data management firm Amalto announced a joint venture to develop a platform to facilitate the automation of ticket-based order-to-cash processes in the oil and gas industry. The emerging blockchain infrastructure aims automate all stages of the process associated with field services in upstream, midstream and downstream markets. Many of the processes, like field ticketing or bill of lading, are still largely manual and paper-based and primed for the blockchain revolution. So from back-office functions to gas trading, blockchain is coming to shake-up the industry. Expect to hear more of the same. But that’s all for the moment folks! Keep reading, keep it ‘crude’! © Gaurav Sharma 2018. 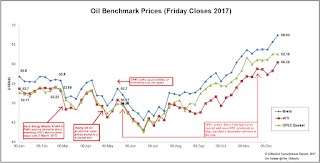 Graph: Oil benchmark Friday closing prices in 2017 © Gaurav Sharma 2017.